← What Does Adventure Mean to You? THERE are mornings I wake up with a head full of heaviness and pull the flysheet back to reveal an outside world full of more heaviness. Today is one of those mornings. 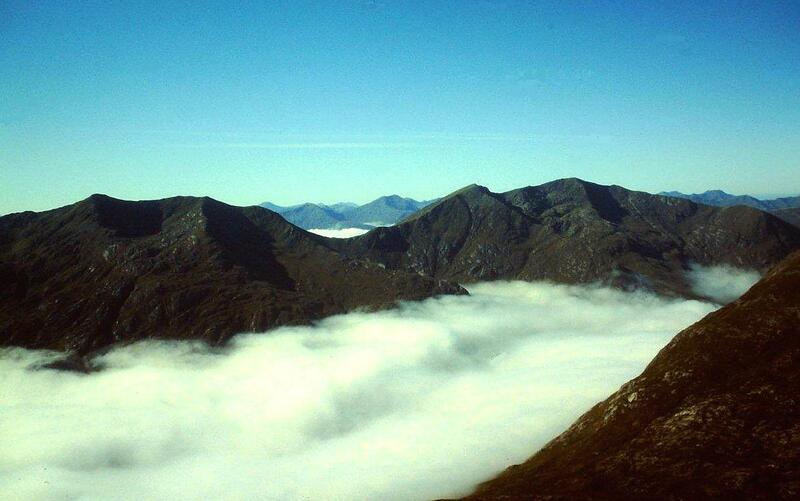 Fog fills Strath Croe. Trees drip drumbeats of moisture on a wet tent. Sounds are muffled. Clothes are cold and damp. The last thing I feel like doing is rolling out of a warm sleeping bag and pushing feet into stiff boots. But a spark glowing in the recesses of the mind tells me that above this grey and smothered world there is another world of pure sunlight and expansive skies. So I pull on the damp clothes and stiff boots and drive slowly south along Glen Shiel to the banks of Loch Cluanie, where the world is still grey and smothered. But that’s life . . . I park the car and listen to the BBC news. The Government is about to publish a dossier on Saddam Hussein’s weapons of mass destruction and prove beyond doubt that this madman is capable of destroying the world within 45 minutes. Blimey. Where would we be without the Joint Intelligence Committee? Up a gum tree and 45 minutes from destruction, that’s where. Also on the news are reports about an earthquake in the Midlands with the epicentre beneath Dudley. I’ve never been to Dudley but my heart goes out to the people who live there. Apparently, the quake measured 4.8 on the Richter scale. Dudley police say “twelve people in their nightclothes walked into Dudley police station” but they don’t say why. Were they fleeing falling masonry, were they injured, were they looking for sanctuary or were they after a cup of tea? We don’t know. Inadequate bit of reporting by the BBC. The fog isn’t lifting and the air is heavy with a clawing moisture that coats every blade of grass. But I summon the will to lace my boots and shoulder my pack because I know – I bloody well know – that on days like these there is light above the darkness. 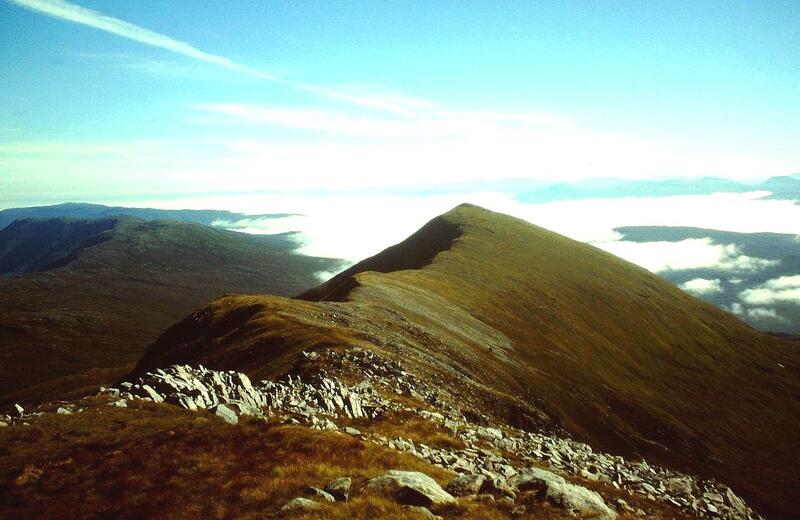 And the Cluanie Ridge will be the perfect place to stroll in that light. 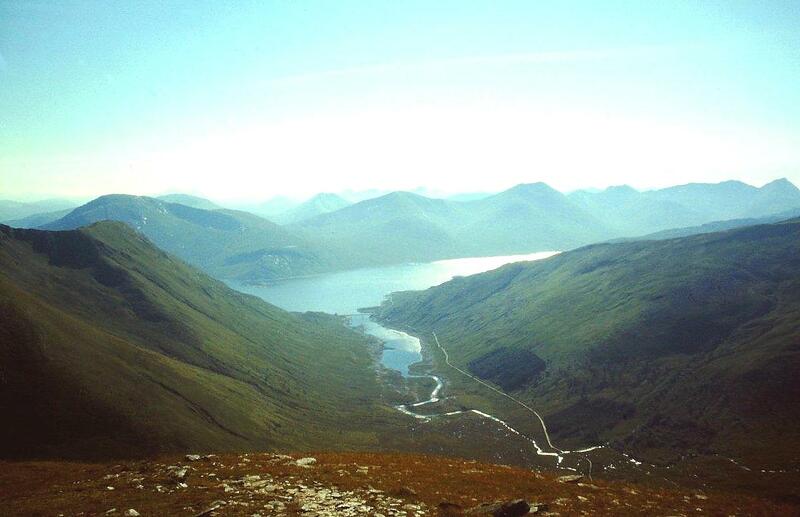 I take the old drove road up the ridge towards Loch Loyne, and at the highest point veer north-west to begin the steep ascent of Creag a’ Mhàim (747m, 3,106ft). And slowly, ever so slowly, my world begins to brighten. Dark grey becomes light grey becomes whiteness becomes watery blue. Watery blue becomes a clear and unspoilt world where a fierce sun burns down and hills shove their shoulders through perfect white cloud. 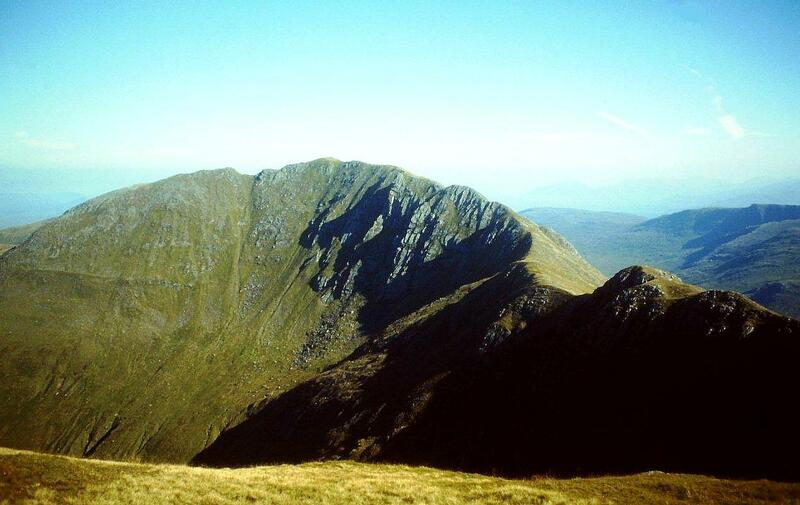 In this world I wander over the summits of Druim Shionnach (987m, 3,238ft), Aonach air Chrith (1,021m, 3,349ft), and Maol Chinn-dearg (981m, 3,218ft). And all the heaviness, the weight and the pressures, are shaken off and left beneath the clouds. I have stepped from one world into another and I don’t want to go back. There is no need to go back because the valley fog has been burned off by the sun before midday. Clear skies stretch from horizon to horizon. I am high in a land of mountains and that’s how things should be. It’s a perfect day. It’s a mountain day. 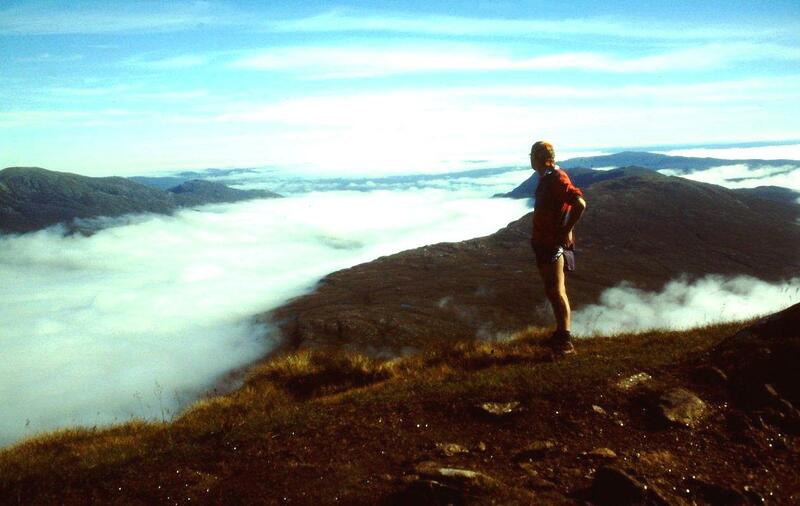 This entry was posted in Camping, Climbing, Drove roads, Environment, Hiking, Mountains, Walking, Weather and tagged Munros, outdoors, Scotland, The Munros. Bookmark the permalink. A sea of clouds.. What a beautiful sight, from grey to vibrant world. I still remember that Saddam Hussein’s news before. Hi Loty. Yes, it’s beautiful, and a very rare sight here in Britain. Thank you for a beautiful description of overcoming drowsiness, Alen. 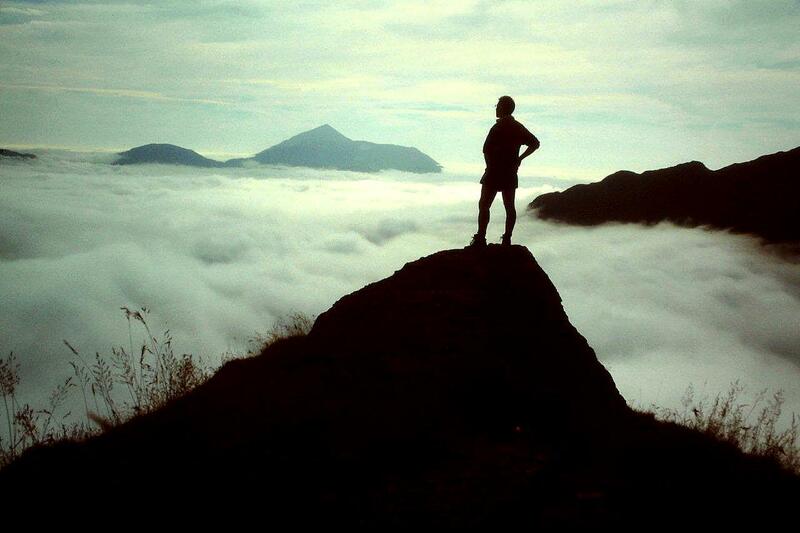 It is a great happiness to reach a mountain top, gain the blue sky, white clouds and a lovely view as a reward. Thank you, Hanna. It was a truly memorable day which lifted the spirit. Hi David. A sunrise would be the perfect state of affairs but they have always given me the slip. Perhaps one day I will manage to capture the two together. 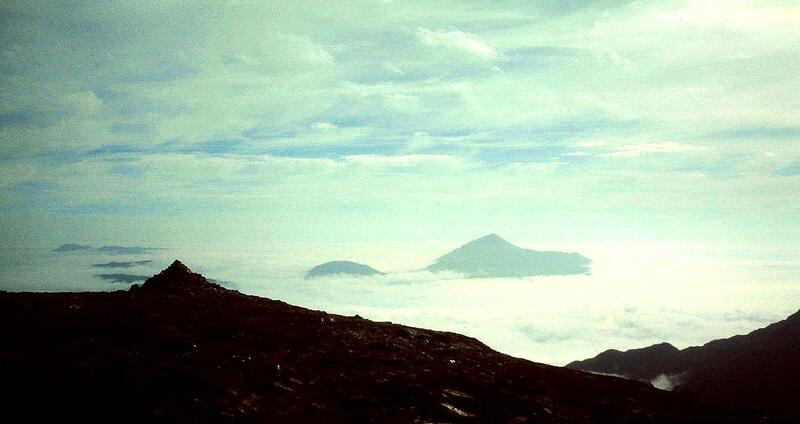 But being above the clouds is always uplifting and makes walking all the more enjoyable. I can tell from the light on the photos you set off way earlier than I did! I suppose that’s what happens when you’re in a tent! You’ve certainly put me off my impending camping trip with your early-morning description – ugh, I remember all that about the damp clothes now but I’d forgotten it until I read this post! I’m an early riser when I’m camping and just the opposite when I’m not. I love camping. It’s great. Hope you have decent weather, Carol, because it can make all the difference. 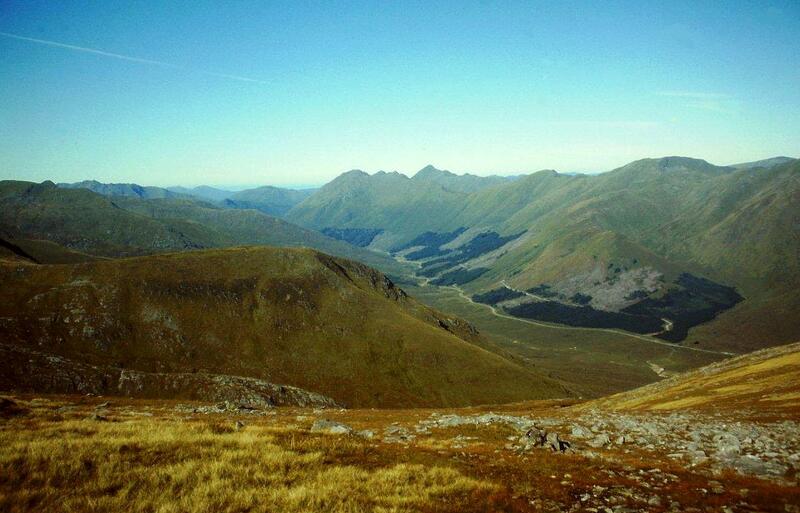 I remember one horrendous night on the campsite behind the petrol station in Glen Shiel. But I won’t tell you about it because I don’t want to put you off. I’m just really soft and think it’s really cold at night right now. I was kipping in the car a couple of nights ago and was cold but at least my clothes weren’t damp and horrid to put on! I always find that kipping in a car is colder and more uncomfortable than a tent. Plus you get spooky things looking at you through the window and lots of condensation if you don’t keep a window open. Remind me never to kip in the New Forest. There was a blinding postcard out at the time for sale in the area… it was just a plain black card with lots of white all-seeing eyes! Vango Force 10s go on for ever. I always wanted one but never got one. Get yourself out there, James, while we’ve got some half decent weather. Get up on the moors and watch the Tour de France go through! Hey, I’ll keep a look-out for you on the telly. Robert Frost strolls again from the morning mist. I’d not heard of this chap before last week, but I see I’m going to have to become acquainted. Thanks for that Danny. And a very good morning to you. Hi Alen, another inspirational post, and your pics are incredible. It’s almost like an allegory, William Golding style. Rising above despair and iniquity and stuff, to achieve enlightenment. (Maybe I need to go back to bed!) How do you know when the weather will be different on the tops? I was just asking because I wouldn’t be all that happy if I got up there and it wasn’t, that’s all! And also, I’m in awe of your ability to remember news headlines in that detail, and associate them with the places where you were at the time. I’ve noticed this before, it’s extraordinary! 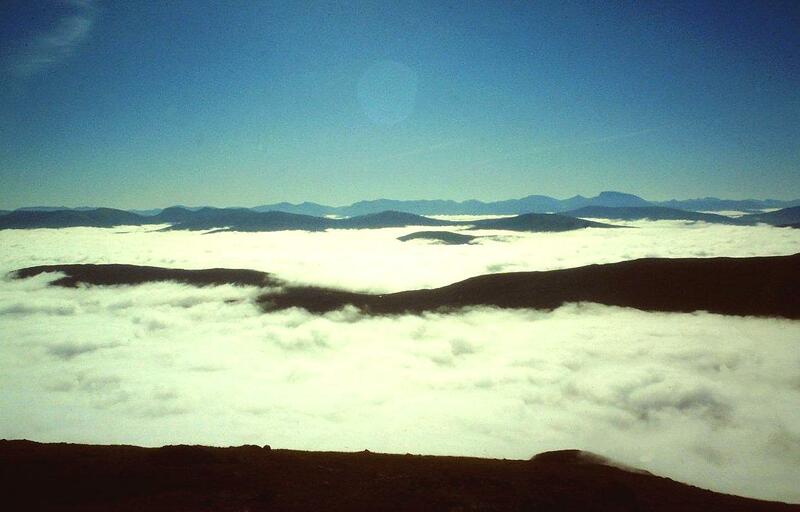 It must have been such a wonderful feeling, being up there in pure sunshine above the clouds and looking down from such a height – really uplifting. I wouldn’t have wanted to come down, either. I have a wonderful memory for headlines, Jo. It started in 1964 when Jim Reeves died. I was on a campsite in Cornwall and all the women were crying. I wanted to play cowboys and Indians and I couldn’t understand why the world was in a state of shock. So now I always associate places with events. When the day is cold and foggy – a proppper fog when visibility is poor – you can bet your mortgage that if you climb up a couple of hundred feet you will rise above it. It’s like a bad haar day. Gain some height and you’re in a completely different world. Sorry about the bad haar pun. I can’t remember who used that one first! Terrible, isn’t it? That’s really extraordinary – I can sometimes remember where I was when I hear certain records (but not the day or even the year!) I would love the experience of climbing above the fog. Oh yes, the pun, it was coined by some Viking lass who didn’t like the way the fog frizzed up her hair. She takes her GHD straighteners everywhere now. Ha ha. The problems we have with our hair.